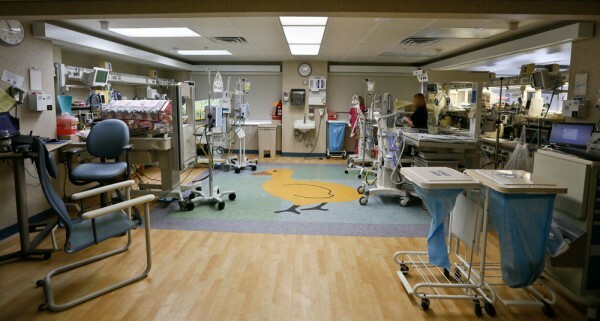 Akron Children’s current NICU at St. Elizabeth’s has an open concept, with no private rooms. 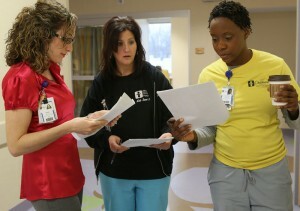 That will change in the new NICU in Boardman. Preparing for a move to a new hospital and a new neonatal intensive care unit can be challenging, exciting and somewhat daunting. These are some of the emotions the staff at Akron Children’s Hospital Mahoning Valley is feeling as we prepare for a move to a brand-new, beautiful NICU located at St. Elizabeth Boardman Health Center. To aid the staff in becoming acclimated to the new unit, many avenues of training are planned by the education coordinators. One specific method that will be used to help the staff become familiar in the new environment is a scavenger hunt. Moving from a unit with an “open” concept where you can see from one end to another is quite different from our new one with private rooms. We’ll need to work differently. The scavenger hunt will help us explore and locate specific things in the unit from a list developed by the unit educators. From locating fire extinguishers and equipment to finding the staff lounge, a scavenger hunt offers us the opportunity to learn our way around the new facility and become familiar in the new surroundings, all to prepare ourselves to provide the best care to the smallest patients.